NUMISMATIC NOTES AND MONOGRAPHS is devoted to essays and treatises on subjects relating to coins, paper money, medals and decorations. THE thirteen coins which are here described were collected in Central Asia many years ago, by the late Dr. Eugene Schuyler (1840-1890), diplomat and author. 1 Eventually put on sale, they came into the possession of the late Rev. William H. Owen of New York City, who presented them to Yale University shortly before his death, which occurred in May, 1944. Mr. Owen was a graduate of Yale in the class of 1897, and for several years prior to his death he had served as Curator of the University's Coin Collection. The history of the acquisition of the little collection by its owner can be conjectured with some probability. In the year 1873 Dr. Schuyler, who at that time was Secretary of Legation at St. Petersburg, made a journey through Central Asia to study the political and social condition of the regions which he visited. He had been U. S. Consul at Moscow in 1867-1869, and it was the Russian régime that he wished to examine. His itinerary took him through Tāshkent, Bukhārā, Samarḳand, and Khoḳand, as well as into regions farther east. The fruit of his researches he published in an important work of two volumes entitled Turkistan (New York, 1876). Schuyler was much interested in the later history of Khoḳand, which at the time of his stay there was in the last throes of its independent existence. Russia was descending on the province, and finally took possession of it in 1875. This was decidedly a change for the better, for ever since the year 1850 the whole region had been in turmoil, which grew steadily worse and seemed to give no prospect of improved conditions. The legitimate khāns of this closing period were members of the family of Shēr 'Alī, who held the office from 1842 to 1845, the year of his death. Our collection contains seven coins, nos. 1-7, dated from the year 1273 a.h. (1856/1857 a.d.) to the year 1285 (1868/1869), thus covering six different reigns and representing the gold coinage of each of these, with one exception: the collection contains no specimen from the reign of the youth Sayyid Sulṭān, who held the throne in the turbulent years 1863-1865, and is known to have struck coins. These gold pieces from the last years of the province constitute perhaps the most important part of the collection, both from the interest of the coins themselves—they are generally fine specimens—and also from the aid which they give in establishing the chronology of this confused period, in which the khānate changed hands rapidly and repeatedly. One of the khāns, who was twice driven out by rivals, each of whom struck his own gold coins, nevertheless fought his way to a third term, which is here twice represented. Since the specimens of this part of the coinage of Khoḳand are somewhat rare in the west (they are doubtless very familiar in Russia), it may not be superfluous to present here a concise sketch of the history of the reigns which are covered, in the hope of adding to the interest of the coins. The following outline of events is chiefly made up from two main sources: 1. Nalivkine (Vladimir Petrovitch), Histoire du Khanat de Khokand , translated from the Russian by Auguste Dozon and published as Vol. IV of the Third Series of the publications of the École des Langues Orientales Vivantes, Paris, 1889; pp. viii, 272, with a map of the province and a table of the Khoḳandian genealogy. 2. Eugene Schuyler, "A Sketch of the History of Khokand in Recent Times," published as Appendix I in the first volume of his Turkistan , pp. 337-359, with a Genealogical Table of the Sovereigns of Khoḳand. Other portions of Schuyler's narrative are occasionally drawn upon. He himself was in Khoḳand while the khānate was still in existence, and much of his information was obtained from eye-witnesses of the events which he describes (see I, 338, footnote 11). In Vol. II, pp. 1-60, he gives an interesting account of the province and the city of Khoḳand, incidentally including some characterization of Khudāyār Khān, three of whose coins are in our collection. See the account of his life and work in the Dictionary of American Biography, Vol. XVI, pp. 471 f. Six other gold coins in the collection, dinars of the Ghaznavids, Khwārizmshahs and Mamlūks, being unrelated to the nineteenth-century coins described below, are omitted from consideration in the present article. This Khānate was established about the year 1700. The eleventh khān in the succession was Shēr 'Alī, who, as was said above, came to the throne in the year 1842. The chronology of the earlier reigns is very uncertain, and even in the later period with which we are now dealing, the dynasty of Shēr 'Alī, differing dates are given by the authorities, as will be seen. Shēr 'Alī left five sons: by his first wife, Ṣārymsaḳ, then twenty-two years of age, Khudāyār, sixteen years, and Sulṭān Murād; by his second wife, Malla, seventeen years, and Sūfī. The chief adviser and minister of Shēr 'Alī had been an official called Musulman Ḳūl, a man of great energy and ability, and he now took charge of affairs. As he was not on good terms with the eldest son, he decided to put the younger brother on the throne. Ṣārymsaḳ, who was in charge of Tāshkent, was formally summoned to Khoḳand, ostensibly to receive the throne, and on his way thither was murdered. On the following day his death was publicly announced and his brother Khudāyār was proclaimed Khān. Up to the year 1850, when Khudāyār came of age, Musulman Ḳūl as regent had his own way in the administration of the province, but after that date the young ruler took affairs into his own hands. He was a man of some energy and great shrewdness, but he possessed few of the qualities desirable in a ruler. 2 Though never popular, he always had powerful adherents. Before many years had elapsed, the province was in turmoil, and the Khān's ruthlessness had gained him bitter enemies. Musulman Ḳūl had been disposed of, but Khudāyār's half brother, Malla, who had been put in charge of Tāshkent, was a rival openly hostile and aiming at the throne. In the summer of a.h. 1269 (1853), Khudāyār attacked his brother in Tāshkent, and Malla, defeated, fled to Bukhārā, where plots against Khoḳand always flourished. Here he was able to make great preparations. Near the middle of the year 1275 (1858/1859), Malla at the head of a strong force laid siege to Khoḳand. Khudāyār's sortie was ineffectual, and with his two younger brothers, Sulṭān Murād and Sūfī, he fled to Bukhārā, where Sūfī soon after died. Malla entered Khoḳand and was proclaimed Khān. He was liked by the people, and his reign seemed to begin under favorable auspices. Trouble soon arose, however, in the neighboring cities, and the Khān found himself in a difficult position. The province was in a ferment of unrest and dissatisfaction. Cities and tribes pressed their just claims, which could hardly be satisfied; 'Ālim Ḳūl, the Khān's chief adviser, paid them little attention. There was open revolt in more than one place. The disturbed situation at length gave to a few of the disaffected leaders the opportunity which they sought. When Khudāyār fled to Bukhārā, as narrated above, he was well received there at first, but was not permitted to remain long in the city, nor even in Samarḳand. The Amir finally assigned him to Jizākh, a strong fortress between Samarḳand and Tāshkent. Here he lived in obscurity and poverty until, with his inveterate money-making ability, he managed to do a small trading business which could support him. Khudāyār's adherents now lost no time. A deputation was sent to him at Jizākh, inviting him to come to Tāshkent, on the western border of the province of Khoḳand, to receive allegiance. He proceeded thither at once, with a company of some two hundred men, and was formally proclaimed Khān. The Amir of Bukhārā, who was always hoping to get a foothold in Khoḳand, promised to give him support. When the news of these events reached the capital city, prompt measures were taken, and a sufficiently large army, with the young Khān at its head, marched on Tāshkent and besieged it. The city was well fortified, however, and after it had held out successfully for thirty-one days, news came to Shāh Murād that the Amir of Bukhārā with a large force was entering the province, and he was therefore obliged to raise the siege and hasten home. Khudāyār's following had increased in the meantime to such an extent that he was now able to advance on Khoḳand. The city was thrown into the utmost confusion, but in the end threw its gates open to its former Khān. 'Ālim Ḳūl made a successful sortie at the head of about two thousand men and escaped. At the very beginning of the uproar Shāh Murād somehow managed to get out of the city without being noticed by anyone. The palace was found vacant, and there was nothing to show whither the young Khān had fled. His disappearance continued to be regarded as a mystery, but according to Schuyler's authorities, it was ascertained afterwards that Khudāyār had succeeded in capturing and murdering him. Khudāyār now entered upon his second Khānate. This was in a.h. 1279 (1862). He had never been popular, and his brutality, especially his massacre of the Kiptchaks, 5 had made him a multitude of enemies. 'Ālim Ḳūl took advantage of the situation so vigorously that he was soon in a position to challenge Khudāyār. The Amir had tired of the game and gone home with his army, after sending presents to 'Ālim Ḳūl. (Both within the city and outside there were now two parties, and this state of things continued for about three years.) Battles were fought; at length the Khān's army was twice defeated, and Khudāyār was finally compelled to flee again to Bukhārā, whence he established himself in Jizākh, as before. 'Ālim Ḳūl entered Khoḳand at the head of a considerable army composed mainly of Kiptchaks and Kirghiz tribesmen. Malla Khān had a son, Sayyid Sulṭān, who at the time of his father's murder was about thirteen years old. 'Ālim Ḳūl had succeeded in getting him out of the palace before the conspirators could lay hands on him, and had brought him to Andijān, and soon after to Namengān. He now summoned the youth to Khoḳand, and gave him the title of Khān. This was in a.h. 1280 (July, 1863). 'Ālim Ḳūl, now the actual ruler, took the severest measures in the attempt to restore order in the disturbed province, and is said to have executed more than four thousand men who were accused of political offenses. A measure of quiet seemed to be achieved, but it was short-lived; discontent increased until the chief cities were sending invitations to Khudāyār to return and take the throne. In the meantime the Russian armies were attacking the province, and as they advanced on Tāshkent, 'Ālim Ḳūl led his army against them, but was defeated. He himself was severely wounded, and soon after died. Khudāyār had sent his brother Sulṭān Murād to the Amir of Bukhārā, asking for help at this favorable juncture, and the Amir responded by coming in person with an army. Khudāyār was making his preparations for a joint expedition when the news of 'Ālim Ḳūl's death reached him. The Amir, with the permission of the Russians, now entered Khoḳand with an imposing force including two elephants, and established Khudāyār in the Khānate for a third term. This was in a.h. 1282 (1865). The youth Sayyid Sulṭān, the nominal ruler, who was not in Khoḳand at the time, was soon apprehended and executed. Coins had been struck in his name, and the British Museum has a gold dinar dated 1280. Our collection possesses no specimen. For a concise chronology of the Khānate, including some mention of the coinage, see E. de Zambaur, Manuel de Généalogie et de Chronologie pour l'histoire de l'Islam; Hanovre, 1927, p. 276. For the coins and their history, specifically, see Lane-Poole's Catalogue of the Oriental Coins in the British Museum, Vol. VII (1882), pp. xxiii f., 86-95; Vol. X (1890), pp. 173 f.
This table will be found to differ considerably from those given in Zambaur and in the British Museum Catalogue. The discrepancy in the dates amounts to two years in several cases, and in one case to three years. Thus far, only the coinage of Khoḳand has been considered. Of the remainder of the collection, seven of the pieces are coins of Bukhārā, mostly of the thirteenth century a.h., and presumably all circulating in that region at the time of Dr. Schuyler's stay there. The history of the acquisition and preservation of these gold coins, combined with the fact that Schuyler was a graduate of Yale in 1859 and Ph.D. in 1861, makes it suitable that they should be given separate publication as a unit of the Yale Collection. A convincing portrait of Khudāyār, from about the year 1870, may be seen in Schuyler's Turkistan , Vol. II, facing p. 25. Schuyler, I,92, gives the account of one who was in the palace at the time. On the revision of the chronology of these reigns, see below. A warlike tribe, inhabiting chiefly a region east of the city of Khoḳand. Khudāyār would have been glad to exterminate them (though his mother was a Kiptchak), and he is said to have butchered some "two thousand" of them. The situation as regards the Russians, in the closing years of the province's independent existence, is clearly set forth in Schuyler's Turkistan , Vol. II, pp. 278 ff. This was the accession year, but he was then a minor; until 1266/1850, when he came of age, affairs were in the hands of the regent, Musulman Ḳūl. He was deposed in 1293/1876. On the coin first mentioned, above, B.M.C. VII, no. 239, the name of the would-be ruler appeared to be given as Muḥammad Malla; but in Vol. X, p. 174, footnote, it was shown that the indistinct characters are to be read as "Beg," rather than "Malla." The name Fūlād appears on the silver coin, p. 173 and Pl. XXXII. 1. Khudāyār Khān, 1273 a.h.
Area, ornamental border between double circles. Pl. , Wt. 4.51 grms. This coin, dated 1273, is from the first of Khudāyār's three reigns; see the historical introduction. B.M.C. VII has dinars of this reign for every year from 1260 to 1266 (nos. 228 to 237), but only one, year 1272, after the last-named date. See Pl. V, no. 228, and Vol. X, p. 173. These were just the years in which the regent Musulman Kūl was in charge of the affairs of state in Khoḳand. How it happened that he struck a dinar in the name of the boy Khudāyār in 1260, though the latter was proclaimed Khān in 1261, is not quite clear; see B.M.C. VII, 91, footnote. The American Numismatic Society has two dinars of this first reign, dated 1272 and 1274. The coins of the Khānate of Khoḳand are a fine series, choice in style and well executed, closely resembling those of the Mangits of Bukhārā, as would be expected. 2. Khudāyār Khān, 1275 a.h.
Pl.  Wt. 3.99 grms. A second coin of Khudāyār's first reign, which ended in this year 1275 a.h. (1857/1858 a.d.). The obverse is plainly dated 1269, with the use of a die formerly employed, the date being just halfway between the latest date (1266) in the British Museum and the earliest (1272) in the American Numismatic Society's collection. 3. Malla Khān, 1275 a.h.
Pl. , Wt. 4.43 grms. Very few coins of Malla are known. Zambaur, Manuel, p. 276, knew of one specimen, presumably in Russia. B.M.C. and A.N.S. have none. Our collection possesses two, each a fine example almost in mint state. The innovation in the style of these dinars is worthy of especial notice. The gay addition to the standard design, and the exuberance of ornamentation, can hardly fail to be understood as reflecting the circumstances of the time, the auspicious beginning of Malla's reign, which nevertheless had such a speedy and terrible ending. Khoḳand had been in high spirits. In No. 3, the obverse border is like that in No. 9, four-pronged stars separated by pairs of dots in upright line. Reverse has the twisted-rope border, and around the inscription, within the inner circle, is an ornamental band with a tassel. 4. Malla Khān, 1276 a.h.
Pl. , Wt. 4.47 grms. See the preceding number, on the special features of these beautiful coins of Malla. The "gay addition" there described is here also present, though in another even more attractive form. To be noted is the remarkable position of the two widely separated parts of the name Khoḳand. 5. Shāh Murād, 1278 a.h.
Pl. , Wt. 4.45 grms. The boy Shāh Murād, who reigned but a few months and soon thereafter was murdered, had his coinage, of which at least one specimen has survived. The dinar in our collection is a fine example, rubbed on the borders, but with the inscriptions in perfect condition. The innovation made in the Malla coinage is discarded, and it never again appears. Zambaur, Manuel, knew of no coin of this reign, and none are mentioned in B.M.C., nor are there any in the A.N.S. The date hitherto given is incorrect. 6. Khudāyār Khān, 1283 a.h. This is of Khudāyār's third reign, which began in 1282 a.h. (1865 a.d.) and continued until 1292, when he was driven out by his own people. Our collection has two coins of this reign, the one here described dated 1283, and another dated 1285. Zambaur recorded one example. Khudāyār's second reign, which began in 1279 (summer of 1862 a.d.) lasted hardly a year; Zambaur knew of one coin from it. The reign of the youth Sayyid Sulṭān, son of Malla, who was put on the throne in 1280 (in July, 1863), is represented by at least two coins which have been preserved, one mentioned by Zambaur, the other in the British Museum, see B.M.C. VII, 94, with Pl. V, no. 238. Our No. 6 is in fine condition. Obverse has a border of six-pronged stars alternating with St. Andrew crosses. Outside this is a border of dots. Reverse's border alternates stars and leaves (?) with rosettes. Outside is a double circle and then a row of dots. 7. Khudāyār Khān, 1285 a.h.
Pl. , Wt. 4.44 grms. See the description in the preceding number. This dinar closely resembles No. 6 in all respects. For the reverse a die of the year 1283 was employed, and consequently two dates can be read. The arrangement of the numerals, in both obverse and reverse, is almost exactly the same on the two coins. 8. Jānid Dynasty, Abū'l-Ghāzī, no mint or date. Pl. , Wt. 4.59 grms. The obverse has a margin of dots between two circles. The reverse has an elaborate margin. This Abū'l-Ghāzī (regn. 1171-1200) was the last of the Jānid line of the Astrakhānids (Lane-Poole, Mohammedan Dynasties, pp. 274 f.). From the time of 'Abd al-Mu'min onward (1160 a.h.=1747 a.d.) the Jānid rulers were such only in name, for the prime ministers held all the power and soon founded their own Mangit Dynasty. See Schuyler, Turkistan , I, 383 ff., and the footnote in B.M.C. VII, 74. The last of the Mangit ministers to hold the authority without ever assuming the titles of sovereignty was the Amīr Dāniyāl, who let Abū'l-Ghāzī rule as Khān. On the death of Dāniyāl (1185 a.h.), he was succeeded by his son, the Amīr Ma'ṣūm, who in the year 1200 took the throne with the title Shāh Murād. According to B.M.C. (ibid. ), 1200 was the year of Abū'l-Ghāzī's death, but this appears to be a mistake. Schuyler, I, 385, puts the date of his death "not earlier than 1796" (1210-11 a.h.); and, in addition, we hear of a coin of Abū'l-Ghāzī in Russia (The Hermitage) dated 1201, see below. According to Schuyler, Shāh Murād did not himself have the title of Khān, though ruling in his own name and with a royal title. For comparison with our dinar of Abū'l-Ghāzī, see B.M.C. VII, 72, no. 171, and the facsimile on Plate V (Abū'l-Faiḍ, commonly written as Abū'l-Feiẓ); also Vol. X, 171m., and the facsimile on Plate XXXII ('Abd al-Mu'min). A.N.S. possesses two dinars of Abū'l-Feiẓ, dated 1138 and 1158. Abū'l-Ghāzī "was the son of a cousin german of Abul-Feiẓ" (Schuyler, I, 383). The testimony of coins of this last ruler of the Jānid line had apparently been doubted, for Schuyler insists (ibid., p. 384): "We have a coin of this Khān with the date of 1200 a.h. … it has been described more than seventy years." "We" presumably means "we in Russia," and there is good reason for believing that another reference to this same coin has been preserved. In Fraehn's Recensio numorum Muhammedanorum, St. Petersburg, 1826, p. 443, there is listed a coin of Abū'l-Ghāzī dated 1200. In his Nova supplementa (1855), p. 131, there is one with the date 1199. In the Markov Inventory, St. Petersburg, 1896, p. 707, three more coins of this Jānid ruler are mentioned: No. 37, no mint, year 1181; No. 38, no mint, year 1194; No. 42, Bukhārā , year 1201 (!). In the Journal of the Royal Asiatic Society for July, 1911, p. 784, an article by Dr. O. Codrington describes a number of coins collected in Seistan by Sir A. Henry McMahon; and among them is a dinar of Abū'l-Ghāzī. See the accompanying Plate, coin no. 11. 9. Mangit Dynasty, Ma'ṣūmī Line. Struck by Ḥaidar, Bukhārā, 1233 a.h. Observe that the dates differ, as frequently happens; see B.M.C. VII, Introduction, p. xl. Pl. , Wt. 4.53 grms. With this coin compare B.M.C. VII, p. 79, no. 184, which re- sembles it very closely. Cf. also in the plates of this volume Pl. V, 179 (date 1230), 188 (date 1235). In this case the reverse has the actual date of the coin, as commonly happens; see however the next following dinar in our series. Ḥaidar (1215-1242 a.h.), son of Amīr Ma'ṣūm, puts on many of his coins the names of his father and grandfather (Amīr Dāniyāl). On this dynasty and its coinage see B.M.C. VII, Introduction, pp. xvii-xxiii, xxxviii-xli. The ornamental border of No. 9 is described above, in the note on No. 3. 10. Mangit Dynasty. Struck by Ḥaidar, Bukhārā, 1236 a.h. Coin somewhat rubbed, not as perfectly preserved as the preceding specimens. Cf. B.M.C. VII, Pl. V, 188, which is the same except for the date on obverse. As was remarked above, this is a case in which obverse has the true date, while reverse has that of a former coinage. See however B.M.C. no. 189, which is our coin with the dates reversed! The border of No. 10 is an elaborate variation of the border of No. 9. 11. Mangit Dynasty. 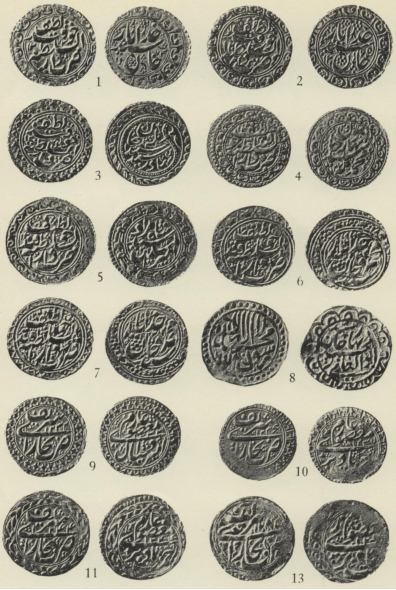 Struck by Naṣr Allāh, Bukhārā, 1244 a.h.
Naṣr Allāh (1242-1277 a.h.), the third son of Ḥaidar, struck coins bearing the same simple inscriptions as those issued by his father. The present specimen is a fine example of the coinage, with the pleasing Persian style of the inscriptions and the characteristic ornamentation. 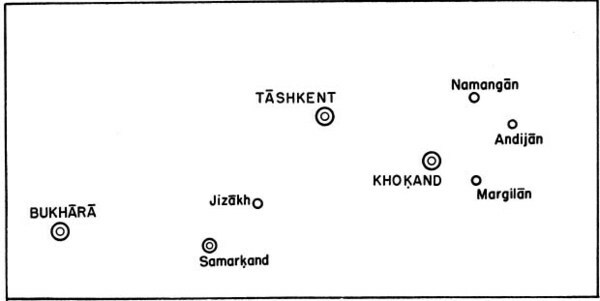 In all the Mangit dinars here shown, the ring enclosing the area is a double ring, and the vacant spaces are occupied by clusters of small dots. In both this coin and the preceding (No. 10) a small anchor-shaped ornament appears at the left, both above and below the long horizontal letter yā. With this coin compare B.M.C. VII, no. 196, which would seem to be its duplicate. 12. Mangit Dynasty. Struck by Naṣr Allāh, Bukhārā, 1257 a.h. Compare B.M.C. VII, 84, no. 207, which agrees in all respects. 13. Mangit Dynasty, Muẓaffar ad-Dīn, Bukhārā, 1285 a.h. The last two figures of the date on the rev. are hardly legible. Pl. , Wt. 4.54 grms. Muẓaffar ad-Dīn, son of Naṣr Allāh, took the throne in 1277 a.h. (1860 a.d.), and held it until he became tributary to the Russians in the campaign of 1284 (1868 a.d.). This dinar, dated 1285, was struck in the same year in which the Russians took possession of the province. Both obverse and reverse have the dotted-rope (guilloche) border, but very little of it can be seen. The coin is badly rubbed. The date on reverse can hardly be made out with certainty; it might even be read as 1278. Coins continued to be struck after the province became tributary to Russia. B.M.C. VII, no. 215, is dated 1294; the American Numismatic Society has dinars of 1289 and 1296. Broadway at 156th Street, New York 32, N. Y.
Vols. 1–3: Monthly, May, 1866–April, 1870. Vols. 4–46: Quarterly, July, 1870–October, 1912. With many plates, illustrations, maps and tables. The numbers necessary to complete broken sets may, in many cases, be obtained. An index to the first fifty volumes has been issued as part of Volume LI. It may be purchased separately for $3.00. The Numismatic Notes and Monographs is a series devoted to essays and treatises on subjects relating to coins, paper money, medals and decorations. Nos. 1–109 inclusive are approximately 4½ × 6⅝ inches in size. Beginning with No. 110 the size is 6⅛ × 9 inches. Sydney P. Noe. Coin Hoards. 1921. 47 pp. 6 pls. 50¢. Edward T. Newell. Octobols of Histiaea. 1921. 25 pp. 2 pls. Out of print. Edward T. Newell. Alexander Hoards–Introduction and Kyparissia Hoard. 1921. 21 pp. 2 pls. Out of print. Howland Wood. The Mexican Revolutionary Coinage, 1913–1916. 1921. 44 pp. 26 pls. Out of print. Leonidas Westervelt. The Jenny Lind Medals and Tokens. 1921. 25 pp. 9 pls. Out of print. Sydney P. Noe. Medallic Work of A. A. Weinman . 1921. 31 pp. 17 pls. Out of print. Gilbert S. Perez. The Mint of the Philippine Islands . 1921. 8 pp. 4 pls. Out of print. David Eugene Smith. Computing Jetons. 1921. 70 pp. 25 pls. $1.50. Edward T. Newell. The First Seleucid Coinage of Tyre . 1921. 40 pp. 8 pls. Out of print. Harrold E. Gillingham. French Orders and Decorations. 1922. 110 pp. 35 pls. Out of print. Howland Wood. Gold Dollars of 1858. 1922. 7 pp. 2 pls. Out of print. R. B. Whitehead. Pre-Mohammedan Coinage of N. W. India . 1922. 56 pp. 15 pls. Out of print. George F. Hill. Attambelos I of Characene . 1922. 12 pp. 3 pls. Out of print. Howland Wood. Commemorative Coinage of the United States . 1922. 63 pp. 7 pls. Out of print. Howland Wood. Tegucigalpa Coinage of 1823. 1923. 16 pp. 2 pls. 50¢. Edward T. Newell. Alexander Hoards–II. Demanhur Hoard. 1923. 162 pp. 8 pls. $2.50. Harrold E. Gillingham. Italian Orders of Chivalry and Medals of Honor. 1923. 146 pp. 34 pls. Out of print. Edward T. Newell. Alexander Hoards–III. Andritsaena . 1924. 39 pp. 6 pls. $1.00. C. T. Seltman. A Hoard from Side. 1924. 20 pp. 3 pls. Out of print. Samuel R. Milbank. The Coinage of Aegina . 1925. 66 pp. 5 pls. $2.00. Edward T. Newell. Mithradates of Parthia and Hyspaosines of Characene . 1925. 18 pp. 2 pls. 50¢. H. Alexander Parsons. The Earliest Coins of Norway . 1926. 41 pp. 1 pl. 50¢. Edward T. Newell. Some Unpublished Coins of Eastern Dynasts. 1926. 21 pp. 2 pls. 50¢. Harrold E. Gillingham. Spanish Orders of Chivalry and Decorations of Honor. 1926. 165 pp. 40 pls. $3.00. Sydney P. Noe. The Coinage of Metapontum . (Part I.) 1927. 134 pp. 23 pls. $3.00. Edward T. Newell. Two Recent Egyptian Hoards–Delta and Keneh . 1927. 34 pp. 3 pls. $1.00. Edward Rogers. The Second and Third Seleucid Coinage of Tyre . 1927. 33 pp. 4 pls. $1.50. Oscar Ravel. The "Colts" of Ambracia . 1928. 180 pp. 19 pls. $3.00. Howland Wood. The Coinage of the Mexican Revolutionists. 1928. 53 pp. 15 pls. $2.50. Edward T. Newell. Alexander Hoards–IV. Olympia . 1929. 31 pp. 9 pls. $1.50. Allen B. West. Fifth and Fourth Century Gold Coins from the Thracian Coast . 1929. 183 pp. 16 pls. $3.00. Gilbert S. Perez. The Leper Colony Currency of Culion . 1929. 10 pp. 3 pls. 50¢. Alfred R. Bellinger. Two Hoards of Attic Bronze Coins. 1930. 14 pp. 4 pls. 50¢. D. H. Cox. The Caparelli Hoard. 1930. 14 pp. 2 pls. 50¢. Bauman L. Belden. A Mint in New York . 1930. 40 pp. 4 pls. 50¢. Alfred R. Bellinger. Two Roman Hoards from Dura-Europos . 1931. 66 pp. 17 pls. $1.50. Geo. F. Hill. Notes on the Ancient Coinage of Hispania Citerior . 1931. 196 pp. 36 double pls. $4.00. Wm. Campbell. Greek and Roman Plated Coins. 1933. 226 pp. 190+pls. $3.50. E. T. Newell. Two Hoards from Minturno . 1933. 38 pp. 5 pls. $1.00. A. F. Pradeau. The Mexican Mints of Alamos and Hermosillo . 1934. 73 pp. illus. 3 pls. $1.50. E. T. Newell. A Hoard from Siphnos . 1934. 17 pp. 1 pl. 50¢. C. H. V. Sutherland. Romano-British Imitations of Bronze Coins of Claudius 1. 1935. 35 pp. 8 double pls. $2.00. Frederick O. Waage. Greek Bronze Coins from a Well at Megara . 1935. 42 pp. 3 pls. $1.00. John Walker. The Coinage of the Second Saffarid Dynasty in Sistan . 1936. 46 pp. 4 double pls. $1.00. Edward T. Newell. The Seleucid Coinage of Tyre , 1936. 34 pp. 5 pls. $1.00. Margaret Crosby andEmily Grace. An Achaean League Hoard. 1936. 44 pp. 4 pls. $1.50. Agnes Baldwin Brett. Victory Issues of Syracuse after 413 B.C. 1936. 6 pp. 2 pls. 50¢. Edward T. Newell. The Pergamene Mint under Philetaerus . 1936. 34 pp. 10 pls. $2.50. Charles C. Torrey. Aramaic Graffiti on Coins of Demanhur . 1937. 13 pp. 2 pls. $1.00. Naphtali Lewis. A Hoard of Folles from Seltz (Alsace). 1937. 81 pp. 5 pls. $2.00. Harold Mattingly andW. P. D. Stebbing. The Richborough Hoard of 'Radiates.' 1931. 1938. 118 pp. 15 pls. $2.50. Alfred R. Bellinger. Coins from Jerash. 1928–1934. 1938. 141 pp. 9 pls. $2.50. Edward T. Newell. Miscellanea Numismatica: Cyrene to India . 1938. 101 pp. 6 pls. $2.00. Edward T. Newell. Late Seleucid Mints in Ake-Ptolemais and Damascus . 1939. 107 pp. 17 pls. $2.00. Harrold E. Gillingham. Counterfeiting in Colonial Pennsylvania . 1939. 52 pp. 2 pls. $1.00. George C. Miles. A Byzantine Weight Validated by al-Walid . 1939. 11 pp. 1 pl. 50¢. Donald F. Brown. Temples of Rome as Coin Types. 1940. 51 pp. 9 pls. $1.50. Eunice Work. The Early Staters of Heraclea Lucaniae . 1940. 40 pp. 8 pls. $2.00. D. H. Cox. A Tarsus Coin Collection in the Adana Museum. 1941. 67 pp. 12 pls. $2.00. Herbert E. Ives. Foreign Imitations of the English Noble. 1941. 36 pp. 5 pls. $1.50. Louis C. West. Gold and Silver Coin Standards in the Roman Empire. 1941. 199 pp. $1.50. Arthur D. McIlvaine. The Silver Dollars of the United States of America . 1941. 36 pp. 1 folded pl. $1.00. J. G. Milne. Kolophon and its Coinage. A Study. 1941. 113 pp. 19 double pls. $2.50. Sawyer McA. Mosser. The Endicott Gift of Greek and Roman Coins. 1941. 65 pp. 9 pls. $1.50. Edgar Erskine Hume. The Medals of the United States Army Medical Department and Medals Honoring Army Medical Officers. 1942. 146 pp. 23 pls. $3.00. Phares O. Sigler. Sycee Silver. 1943. 37 pp. 6 pls. $1.00. Sydney P. Noe. The Castine Deposit: An American Hoard. 1942. 37 pp. 4 pls. $1.00. H. F. Bowker. A Numismatic Bibliography of the Far East. 1943. 144 pp. $1.50. Sydney P. Noe. The New England and Willow Tree Coinages of Massachusetts. 1943. 56 pp. 16 pls. $3.00. Nai Chi Chang. An Inscribed Chinese Ingot of the XII Century A. D. 1944. 9 pp. 2 pls. 50¢. George L. McKay. Early American Currency. 1944. 85 pp. 27 pls. Out of print. Edward T. Newell. The Byzantine Hoard of Lagbe . 1945. 22 pp. 8 pls. $1.00. James C. Risk. British Orders and Decorations. 1945. 124 pp. 76 pls. $4.00. Bluma L. Trell. The Temple of Artemis at Ephesos . 1945. 71 pp. 28 pls. $2.00. Karel O. Castelin. The Coinage of Rhesaena in Mesopotamia . 1946. 11 pp. 17 pls. $2.00. Aline A. Boyce. Coins of Tingi with Latin Legends. 1947. 27 pp. 5 pls. $1.00. Sydney P. Noe. The Oak Tree Coinage of Massachusetts . 1947. 23 pp. 10 pls. $1.50. George C. Miles. Early Arabic Glass Weights and Stamps. 1948. 168 pp. 14 pls. $5.00. Philip V. Hill. "Barbarous Radiates:" Imitations of Third-Century Roman Coins. 1949. 44 pp. 4 pls. $2.00. Richard N. Frye. Notes on the Early Coinage of Transoxiana . 1949. 49 pp. 1 pl. $2.00. William H. Dillistin. Bank Note Reporters and Counterfeit Detectors 1826–1866. 1949. 175 pp. 19 pls. $3.50. O. P. Eklund andSydney P. Noe. Hacienda Tokens of Mexico . 1949. 46 pp. 22 pls. $2.50. The American Numismatic Society Museum Notes is a publication consisting principally of brief notes and papers on items in the Society's collections. I–1946. 106 pp. 23 pls. $1.50. II–1947. 118 pp. 19 pls. $1.50. III–1948. 154 pp. 26 pls. $5.00. This series accommodates works of full book length, 7¾ × 10¾ inches in size. Edward T. Newell. The Coinage of the Eastern Seleucid Mints from Seleucus I to Antiochus III . 1938. 307 pp. 56 pls. $6.00. George C. Miles. The Numismatic History of Rayy . 1938. 240 pp. 6 pls. $4.00. Alfred R. Bellinger. The Syrian Tetradrachms of Caracalla and Macrinus . 1940. 116 pp. 26 pls. $5.00. Edward T. Newell. The Coinage of the Western Seleucid Mints from Seleucus I to Antiochus III . 1941. 450 pp. 86 pls. $10.00. Jocelyn M. C. Toynbee. Roman Medallions. 1944. 268 pp. 49 pls. Out of print. A quarterly listing of current numismatic publications with abstracts of their content. Subscription price to non-members is $2.00 per year postpaid. Single current issues, $.50 each.